The United States International Trade Commission publishes several investigation reports each year (primarily Section 332, 337, and 731 reports). Originally, it was part of the Printing Department’s job to create covers for all investigation reports. It was decided that the Operation who created the report should also create the various covers necessary (letter size and wraparound print covers, CD covers, inside covers, and title pages) to increase efficiency. 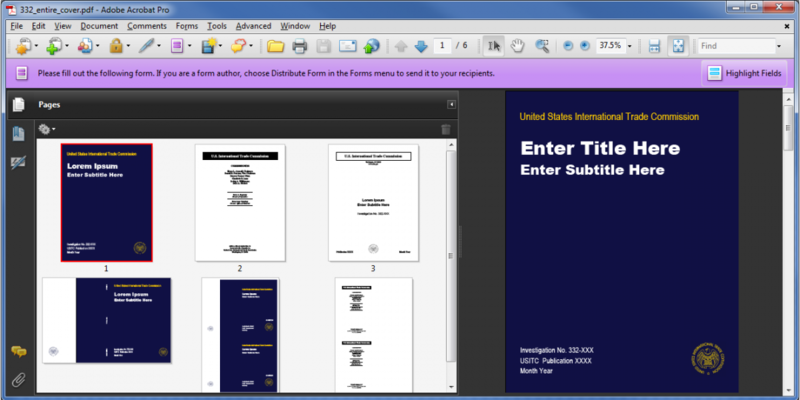 To ensure that all covers and information were consistent, I developed a fillable form in Adobe LiveCycle Designer so that the person who was creating the cover only had to input the information (title, subtitle, investigation number, publication number, date) one time, rather than over and over on each version of the cover, using Adobe Acrobat Reader, as opposed to additional (costly) software. This increased efficiency, and also reduced the number of typos and mistakes on the cover pages. See the 332 cover in action.